Craft beers, local foods, artisan coffees - Orange County has been having its fill of niche businesses that get food and drink enthusiasts excited about their products but there are still a few segments missing. What about spirits? 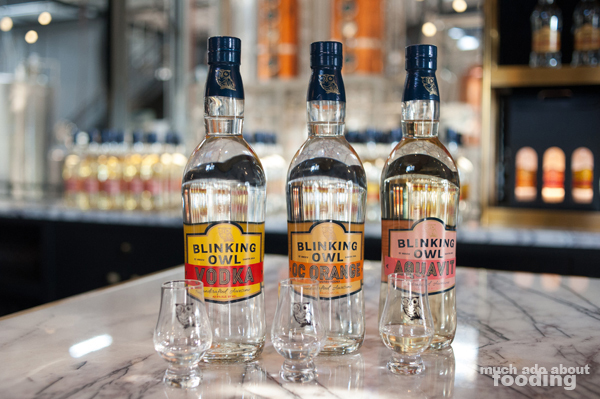 The answer is here now as Blinking Owl Distillery opens its doors and productions in Santa Ana. 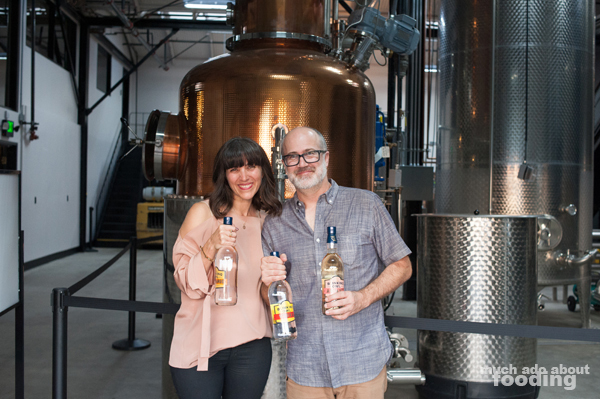 Brought into the community by long-time Santa Ana residents Brian and Robin Christenson, the distillery is the first for the county and already has highly lofty goals for itself. 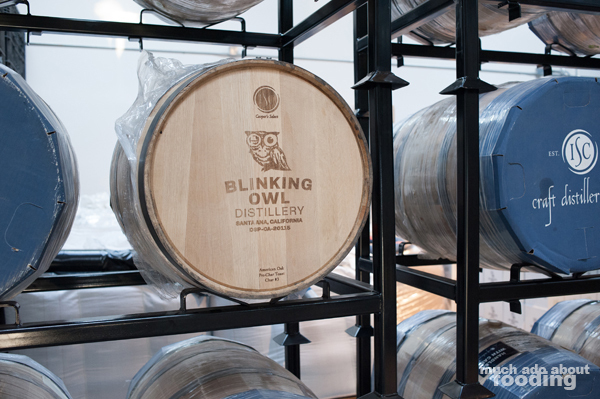 Named after a since-gone bar in the city called the "Blinking Owl Bar" which had a blinking owl sign, the new distillery is more than just an exciting new spirit producer but also a local spot for the community to host events, relax in a tasting room, and learn more about production through hosted tours. The location of Blinking Owl is unassuming, set among residential houses and a few industrial buildings, but stepping inside, you realize just how aware they were of making an impression. The beautiful marble bar tops juxtaposed to polished metallic elements (mainly gold in color) along with black accents made for an elegant, stylish space. "It's time for Orange County to have an opportunity like this. Robin did 90% of the design to be a mixture of chic, feminine, and masculine. The bottle was also specifically designed for both men and women with a tapered waist to make it easy for any size hand while still having a whisky bottle design 'prestige.'" In addition to being visually appealing by design, Blinking Owl also works on carefully honing the craft of their products to be appealing in taste and make-up. Their license allows for serving up to 1.5 oz per person in the tasting room and selling up to three 750mL bottles per person daily. Those bottles could be of their organic durum wheat vodka, orange-infused vodka, aquavit, gin, and/or whisky - whichever fits customers' fancy. 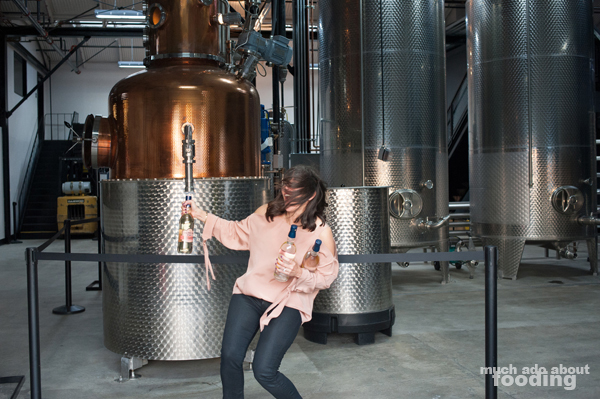 What is special about these spirits, however, is their production and sourcing. 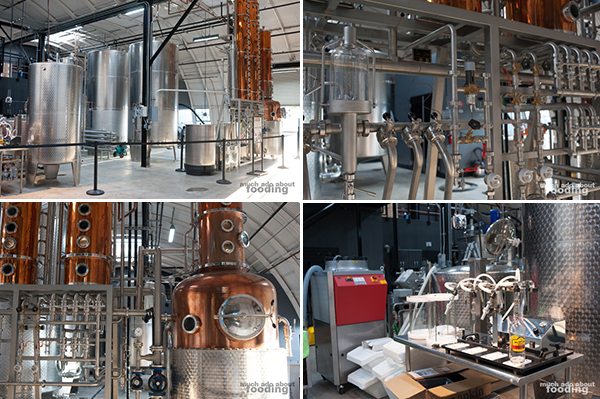 They mill, mash, ferment, distill, and age everything themselves to ensure quality. As for ingredients, the goal is eventually to be 100% Californian. "Our take is to source as much California-grown product as possible. The white organic corn is from California; the wheat is Californian. Both are crucial to building a local crop mindset. In our aquavit, we use hibiscus which is the flower of Santa Ana. The orange flavored vodka uses oranges from the OC Heritage Museum. Our whisky is grown, made, and aged in California because it just makes sense here. Why not make products that highlight our climate and seasons? We have an ideal aging climate with heat in the day and coolness in the night. The swinging temperatures are good for aging so our whisky is aging in half the time as somewhere else." 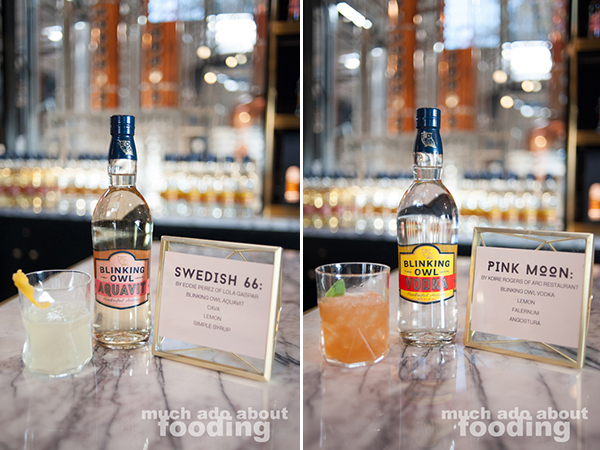 Now if you have never had aquavit, you need to try theirs. Robin informed us of how proud they are of how this Scandinavian spirit turned out and with good reason - it is delicious! The spirit is similar to gin but rather than using juniper as the primary botanical, aquavit is an amalgam of caraway, cardamom, and dill (along with many other botanicals). 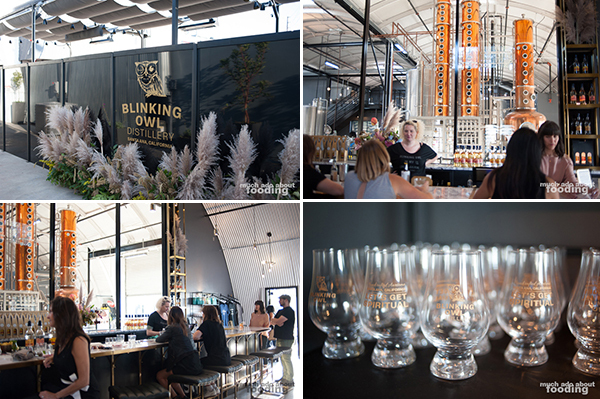 The Blinking Owl tasting room does allow for taster sizes but you might also want to give some attention to their cocktail capabilities there which are created by local mixologists. The distillery is impressive and also manages to be beautiful for what it is. 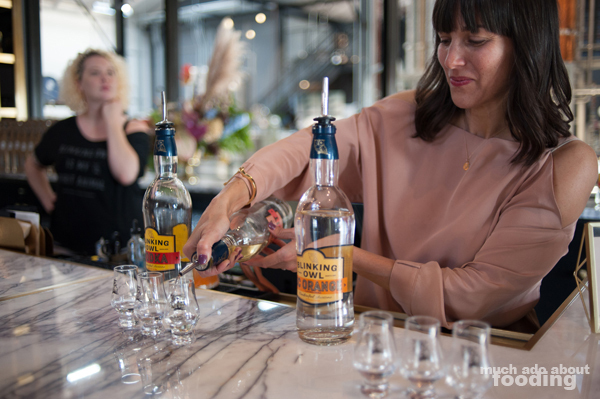 In addition to being perfectionists in their crafts, the Christensons also have an advantage by producing their spirits in the city of Santa Ana - the water. The city was named in 2016 to having the 4th best tasting water in the country so if that's the case, what happens when you use such an award-winner as your base? You get the smooth, clean, and beautiful bottles of vodka, gin, aquavit, and whisky that Blinking Owl makes. Now, if you don't make it to the tasting room to get a few sips in, don't fret. The distillery is well-ingrained in the Orange County dining scene and already has culinary professional friends clamoring for bottles to stock their bars. Soon enough, you'll be able to get swing a swig of their spirits. "We take our product really seriously but not ourselves seriously. Let's get spiritual!" Check out Blinking Owl at 802 E. Washington Ave, Santa Ana, CA 92701, making sure to plan for plenty of time for finding parking.